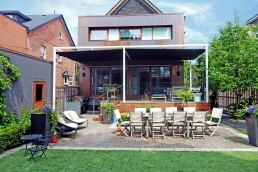 This urban oasis occupies a small area and returns big results. It is an excellent example of how good design can get more from less space. 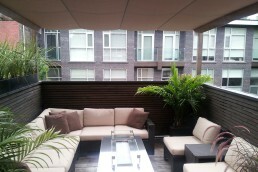 The homeowners treat this terrace like an extra room of their fine townhome five months out of the year. Before the waterproof deck cover, the nightly routine was to bring in all the cushions. Even if it didn’t rain, dew would form and the cushions would be wet in the morning. Now with the protection of ShadeFX, the nightly routine is to leave the cushions where they are and enjoy a little more free time. 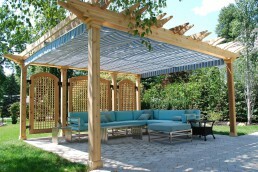 The canopy is in waterproof Harbor Time Driftwood which is a perfect complement to the darkly stained wood pergola. 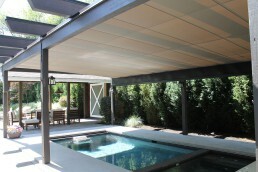 The canopy was sized to extend beyond the pergola frame so the drip line is beyond the railing. 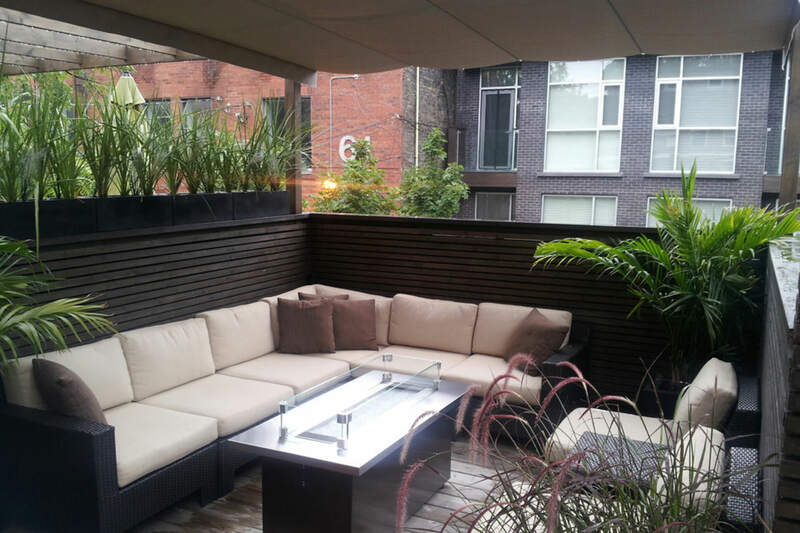 With the addition of the alcohol-fueled coffee table/hearth, this outdoor living space is comfortable and inviting, even in mildly inclement weather. 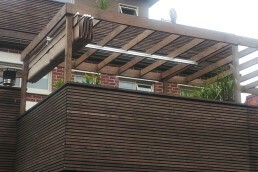 Wind is one kind of inclement weather that can play havoc with awnings and canopies. This is a key reason to choose ShadeFX on a pergola over a roll retractable awning in windy downtown locations. This urban oasis occupies a small area and returns big results. It is an excellent example of how good design can get more from less space. 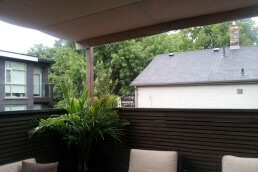 The homeowners treat this terrace like an extra room of their fine townhome five months out of the year.